Did you watch last week's broadcast premiere of ABC's Fresh Off The Boat? If you enjoyed it and plan on tuning in again, watch the show in its regular time slot on Tuesday night with two episodes at 8:00pm and 8:30pm... then join us on the internets for the after-show, "Fresh Off The Air"! 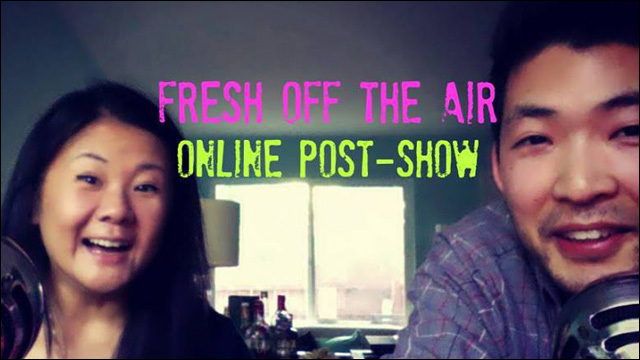 Comedian/writer Jenny Yang and I are hosting an unofficial Fresh Off The Boat post-show which will stream online via Google Hangout. We'll talk about the episodes, raise some issues and answer a few questions. Log on and help us continue the conversation about our new favorite show. We'll hop on here at 9:05PM Pacific Standard Time, immediately after the show airs on the west coast. Join Angry Asian Man, Phil Yu and comedian Jenny Yang for the first-ever unofficial FRESH OFF THE BOAT post-show - streaming live online. Watch FRESH OFF THE BOAT new episodes on ABC. 9:05 PM PST - Click on the link below to hang out with us online and debrief Tuesday's back-to-back episodes! For more details, refer to the Facebook event. We hope to make this a regular thing. See you on the internet!